New year, new books out! 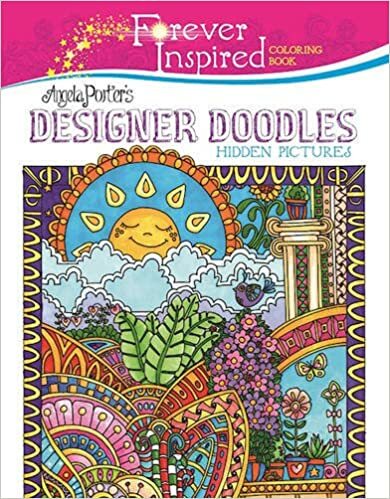 The first is the sixth in the ‘Color Me’ series from Race Point Publishing, part of the Quartos group. 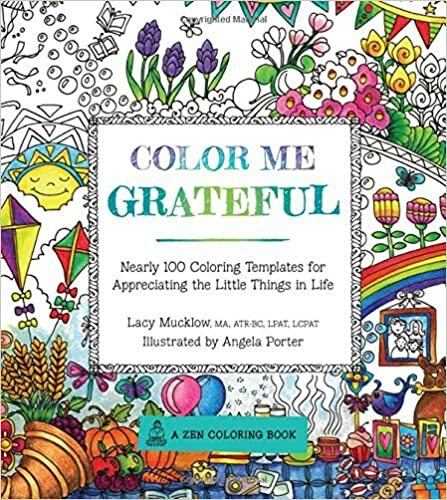 This one is called Color Me Grateful, and is Lacy Mucklow and I It’s already available in the US, and in the UK from Thursday. 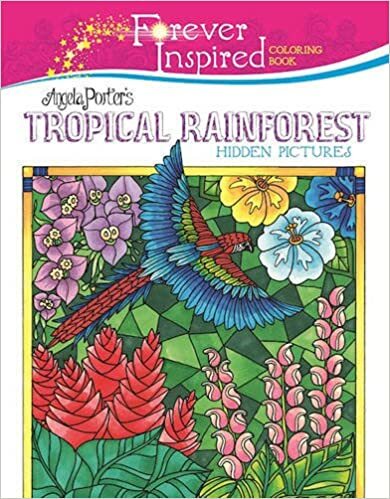 Out now, are two titles in the Forever Inspired series from Skyhorse Publishing – Angela Porter’s Designer Doodles and Angela Porter’s Tropical Rainforest. I have designed sets of clear stamps for Hampton Arts. The range is called ‘Color Me by Angela Porter’. 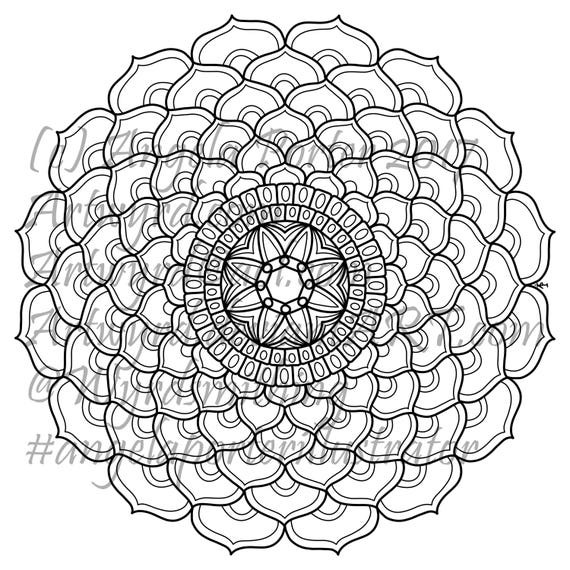 It’s been a lovely challenge to do, and another string to my artistic bow too. I’m being sent my own sets of the stamps and I can’t wait to play with them and embossing powder in particular to get the ‘stained glass’ kind of colours that I so love! Of course I’ll post my versions here. It’s all exciting for me! Everything! Testing coloured pencils and methods of blending them. I have been reading much debate on various facebook colouring groups about the best pencils to use and so on, and some of the things that are said seem to put a lot of pressure on people who are on limited budgets to feel their artwork isn’t any good because they aren’t using the best, most expensive pencils or products or they don’t have loads and loads of products to use. I may get slated and harangued for this, but I have to say it. The thing that makes the biggest difference to the end product isn’t so much the exact pencils you use but the way in which you use them. There’s an old adage that says a poor workman blames his tools, and to a degree this is true. If you are going to make a work of art that is to last for aeons, then yes, it is important to use the best of the best – acid-free archival quality paper, canvas, board, paints,pencils, pastels, etc etc. However, is this really what we are doing when we colour in templates on printer paper that is most likely not acid free, or the books we buy? The chances are not. 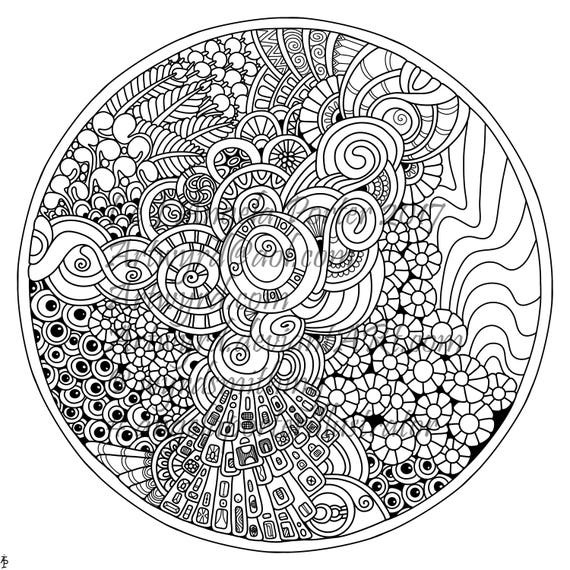 People colour for lots of different reasons, and you need to examine your reason for enjoying colouring – it is something that should make you feel good in some way, not bad. It should be an activity that isn’t filled with worries and concerns, it should be an activity that is carefree, relaxing and meditative. It should allow you to take a break from your day to day worries. 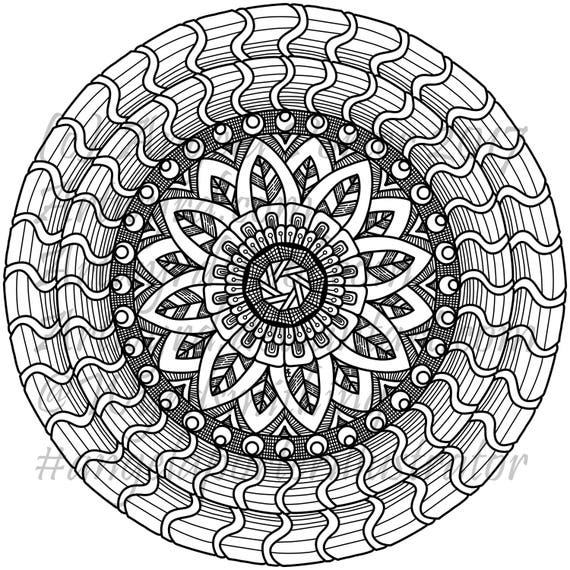 It is an activity that can fit into anyone’s budget, and no one should be made to feel less because they have a tight budget, and the worry about what others will think will take away from the whole purpose of coloring. While the more expensive brands of pencils may make it easier to achieve various effects, that they may be more highly pigmented, that they may be less susceptible to breakage, are the cheaper pencils really that bad? I admit it. I use Crayolas as well as Faber-Castell’s Polychromos. I have Staedtler pencils of different price ranges in my collection. I have kids pencils, Pentel pencils, all sorts. What makes me choose a particular colour pencil over another is the colour and the vibrancy of the colour more than the make or ‘model’ of the pencil! So, what I thought I’d do is to do a little test. And this image shows the results of my tests! And I’ll divulge some observations underneath! The first rows are just one colour of gradient colouring and various ways of blending out the gradient. I tried to achieve the same effect, not being too fussy, in each case. Surprisingly, the Crayola pencil layered onto the paper really easily, much less effort was needed than for the Polychromos pencils, which were the hardest to lay the colour down with. The Polychromos needed a lot of pressure to get a thick layer of colour down. The various forms of blending worked well with all the pencils, but the blending solution gave the smoothest blending of all. In all cases, there wasn’t much difference in the final blended version, which surprised me as you’d expect there to be when dealing with pencils from the bottom end and top end of the market. I then tried the blending solution to see how well it blended heavily laid down colour out over clean paper. Here, the higher pigment content of the Polychromos pencils showed a bigger area could be blended out. However, Crayolas and the Art-Colour Pencils weren’t far behind. The Art-Grip pencils, again by Faber-Castell, were the worst, yet they were the second most expensive pencils tested. The last rows show how well various shades of pencils can be blended by the different methods. I was really surprised at how well the Crayolas did – they blended far more easily and smoothly with all the different blending methods! Of course, the best method of blending for smoothness is by using blending solution. 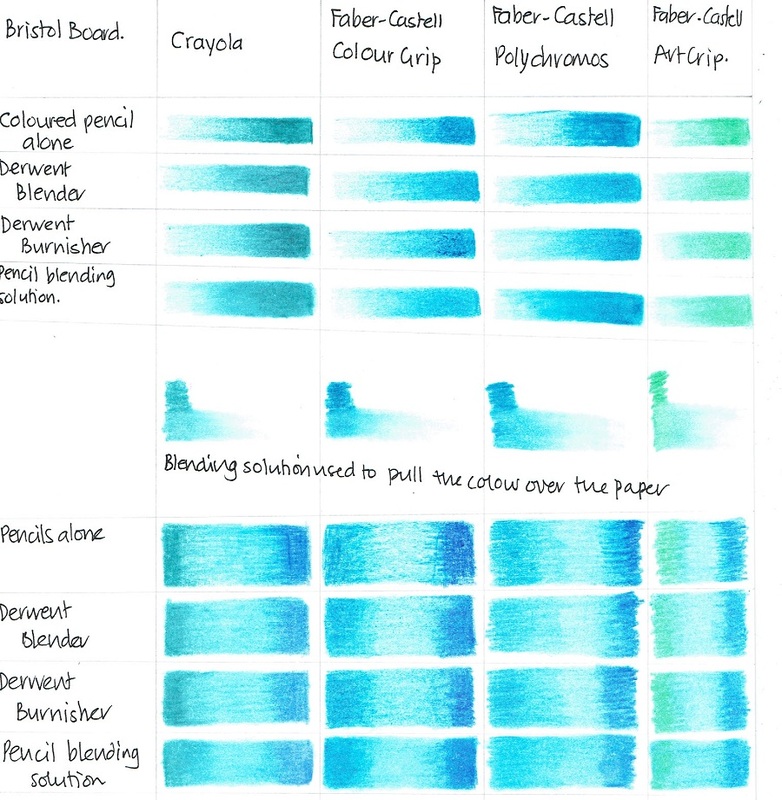 I will say it again, I did my best to make this a test that compares the different brands fairly and took my time to ensure that the colours were laid down with as equal intensity and with the same method in all cases. I must admit, I didn’t expect Crayolas to do as well as the other, more expensive pencils. However, the Crayolas did significantly better, in my opinion, in many instances. What a shocker! The big advantage that the more expensive pencils have is the huge range of colours available, which makes finding the precise colour you want to use easy and you don’t have to worry about how to mix different coloured pencils to get that colour you want. The thing going for the Crayolas is their price point, they are easier to lay down than other brands which have harder leads, they blend really well and easily. I hope this helps. As I’ve said (typed? ), I expect a lot of criticism and haranguing for this, but so be it, I speak as I find, and I found that all the pencils I tried out worked more than good enough for me, and I’m happy with that!